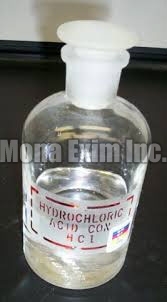 We can be contacted for purchasing Hydrochloric Acid as per the requirement. Our Hydrochloric Acid is well tested by the chemical experts on various parameters in order to ensure optimum efficacy. Hydrochloric Acid finds usage in performing numerous chemical reactions in laboratories, for metal treatment and many industrial applications. We pack Hydrochloric Acid with utmost care in order to ensure safe transition and usage. Also, it is reasonably priced.